"My new teeth took ten years off my face. I wish I had done this sooner." There are several types of complete/full dentures. A conventional full denture is made and placed in the patient’s mouth after the remaining teeth are removed and tissues have healed which may take several months. An immediate full denture is inserted as soon as the remaining teeth are removed. We take measurements and makes models of the patient’s jaws during a preliminary visit. With immediate dentures, the denture wearer does not have to be without teeth during the healing period. We also can make a duplicate denture for you without taking your existing denture. Please call us today if you need a duplicate denture made. It is a quick and easy process. 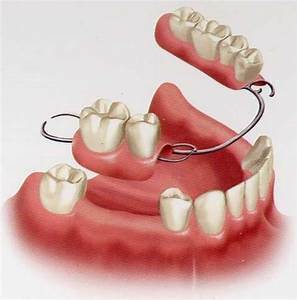 Removable partial dentures usually consist of replacement teeth attached to pink or gum colored plastic bases, which are connected by metal framework. Removable partial dentures attach to your natural teeth with metal clasps or devices called precision attachments. Precision attachments are generally more aesthetic than metal clasps and they are nearly invisible. Crowns on your natural teeth may improve the fit of a removable partial denture and they are usually required with attachments. Dentures with precision attachments generally cost more than those with metal clasps. We also have several metal-free options. Consult with us to find out which type is right for you. If you’re interested in restoring your teeth with dentures but don’t like the feel of traditional full-palate dentures, snap-on dentures may be a good fit for you. Family and Cosmetic Dentistry of Kokomo offers snap-ons and other types of dentures at our office. Snap on dentures are a removable, palate-less denture that snaps on and off as many times as needed. 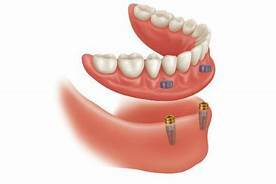 The snap or "clip" happens when the denture is pressed gently onto the head of the mini implants. Providing a removable solution AND a strong bite! Snap on dentures provide the strength and stability to eat the foods you like, such as nuts, apples, carrots, etc. Snap on dentures are NOT permanent dentures. For the first few weeks, your new denture may feel awkward or bulky. However, your mouth will eventually become accustomed to wearing it. Inserting and removing the denture will require some practice. Follow all instructions given to you by Dr. Melissa. Your denture should fit into place with relative ease. Never force the denture into position by biting down. Dr. Melissa will give you specific instructions about how long the denture should be worn and when it should be removed. Initially, you may be asked to wear your denture all the time. Although this may be temporarily uncomfortable, it is the quickest way to identify those denture parts that may need adjustment. If the denture puts too much pressure on a particular area, that spot will become sore. We will adjust the denture to fit more comfortably. After making adjustments, we recommend that you take the denture out of your mouth before going to bed and replace it in the morning. Will it be difficult to eat with a denture? It can be difficult to speak clearly when you are missing teeth. Consequently, wearing a denture may help. If you find it difficult to pronounce certain words with your new denture, practice reading out loud. Repeat the words that give you trouble. With time, you will become accustomed to speaking properly with your denture. Handling a denture requires care. It's a good idea to stand over a folded towel or a sink of water just in case you accidentally drop the denture. Brush the denture each day to remove food deposits and plaque. Brushing your denture helps prevent the appliance from becoming permanently stained. It’s best to use a brush that is designed for cleaning dentures. A denture brush has bristles that are arranged to fit the shape of the denture. A regular, soft-bristled toothbrush is also acceptable. Store-bought denture cleaner works well, but some people use hand soap or mild dish washing liquid to clean their dentures, which are both acceptable. Other types of household cleaners and many types of toothpaste are too abrasive and should not be used for cleaning dentures. A denture could lose its proper shape if it is not kept moist. At night, the denture should be placed in soaking solution or water. Also, if the appliance has metal attachments, they could be tarnished if placed in any bleach solution. Over time, adjusting the denture may be necessary. As you age, your mouth naturally changes, which can affect the fit of the denture. Your bone and gum ridges can recede or shrink, resulting in a loose-fitting denture. Dentures that do not fit properly should be adjusted by Dr. Melissa. Loose dentures can cause various problems, including sores or infections. See us promptly if your denture becomes loose. Relines can make poor fitting dentures fit better. What is the Difference Between Traditional and Snap-on Dentures? Traditional full-palate upper dentures come with a palate section that helps keep the dentures suctioned in place. This palate section is uncomfortable for many people and can lead to difficulties with swallowing or speaking. Traditional lower dentures have no way to stay in place, and their constant movement can lead to gum pain. Brushing twice a day and cleaning between your teeth daily help prevent tooth decay and periodontal (gum) disease that can lead to tooth loss. Pay special attention to cleaning teeth that fit under the denture’s metal clasps. Plaque that becomes trapped under the clasps will increase the risk of tooth decay. Dr. Melissa or our dental hygienist can demonstrate how to properly brush and clean between teeth. Selecting a balanced diet for proper nutrition is also important. If you have full dentures, it is also important to clean your gum tissue daily. Brush your gums and tongue with a soft brush twice daily. If you have natural teeth and partial dentures, we recommend coming to see us 2-3 times per year. If you have full dentures we recommend one visit per year. Full dentures are called "conventional" or "immediate" according to when they are made and when they are inserted into the mouth. Immediate dentures are inserted immediately after the removal of the remaining teeth. To make this possible, we take measurements and make the models of the patient’s jaws during a preliminary visit. An advantage of immediate dentures is that the wearer does not have to be without teeth during the healing period. However, bones and gums can shrink over time, especially during the period of healing in the first six months after the removal of teeth. When gums shrink, immediate dentures may require re-basing or relining to fit properly. A conventional denture can then be made once the tissues have healed. Healing may take at least 4-6 months. Denture adhesive can provide additional retention for well-fitting dentures. Denture adhesives are not the solution for old, ill-fitting dentures. A poorly fitting denture, which causes constant irritation over a long period, may contribute to the development of sores. These dentures may need a reline or need to be replaced. If your dentures begin to feel loose, or cause pronounced discomfort, consult with Dr. Melissa immediately. Over time, dentures will need to be relined, rebased, or remade due to normal wear. To reline or rebase a denture, Dr. Melissa uses the existing denture teeth and refits the denture base or makes a new denture base. Dentures may need to be replaced if they become loose and the teeth show signs of significant wear. Dentures become loose because a mouth naturally changes with age. Bone and gum ridges can recede or shrink, causing jaws to align differently. Shrinking ridges can cause dentures to fit less securely. Loose dentures can cause health problems, including sores and infections. A loose denture also makes chewing more difficult and may change your facial features. It's important to replace worn or poorly-fitting dentures before they cause problems.